Many of us fail to realise just how important the destruction of our household utility bills are once they have fulfilled their purpose. It is surprising to learn just how much information those intent on identity theft can find on these utility bills and more surprising is just how much damage they can do to your credit rating should they employ these details in fraudulent purchases. Each month hundreds of thousands of households across the United Kingdom receive utility and other bills through the mail and as such accumulate quite a considerable amount of information which can be used for rather nefarious purposes if it falls into the wrong hands. Most bills will contain information such as name, address, telephone number, possibly mobile telephone numbers and even details of loans and bank details. Of course depending on the household the number of bills may vary greatly and indeed so may the information contained in them. For example some household bills - such as those relating to the renewal of car insurance - may contain information on the vehicle you drive; make, model and even registration mark. This is something that many people struggle with. What should be kept for purposes of information and what should be discarded? The truth of the matter is that some household bills should be kept hold of for a least six months, longer if the provider of the bill has been known to make mistakes with billing or charging. Again those individuals who find themselves in charge of the household bills often find that keeping them together in a large folder, drawer or wallet, ultimately find that there is a need to make space for new and therefore must dispense with the old. Depending on the nature of these bills you should make every effort to ensure that it is as difficult - if not impossible - for the identity fraudster to be able to make sense of the information. With this in mind you should always - where possible - shred all bills after having removed them from their envelopes. 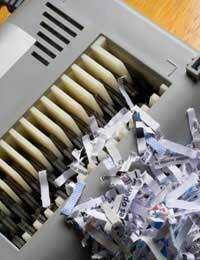 As time consuming as it may seem you should shred each bill individually; this increases the chances of the document being destroyed beyond recognition. There are those among us who try to shred documents in bundles and although this does work in as much as the bills are shredded, it increases the chances of an identity thief being able to piece some of the information back together. Destroy the envelopes separately and again where possible remove the labels from envelopes that can be reused. You should also check the insides of all envelopes for loose compliment slips or small notes that may have been left behind. As we have mentioned already it is possible to purchase a rather inexpensive shredder that will allow you to dispose of any paperwork no longer necessary. Once you have shredded all of this information and are happy that it can no longer be pieced together you should place it all in biodegradable bags and tie them. Most councils offer paper recycling services which involve putting such paper waste out for collection. Where possible do this on the day of collection and not the night before. Putting such paper out the night before can increase the chances of it being blown away in heavy winds or indeed being sifted through by individuals looking for identity details. If you have a large garden and are not in danger of upsetting your neighbours a small fire once every so often - or even a barbecue - is a good way in which to dispose of unwanted paper material. However you should be careful in not just how to handle the fire but also how to dispose of the paper. Do not put it to the bottom of the fire; this is noticeably the least hot and as such the paper may not burn completely. Many institutions now - such as banks and building societies - allow for account statements and the likes to be sent via email. If you are satisfied that your computer is secure and not in danger of being hacked or accessed by those around you who shouldn't have access to it, then you should consider the possibility of online banking. Online banking speeds up your ability to pay household bills, to set up direct debits, and standing orders and also make money transfers from one account to another. It also allows for the delivery of bank and building society statements without sending them through the post. Where necessary statements can be printed off from your online account or migrated into financial software packages such as spreadsheets and payroll. For more information on reducing your paper bills you should contact your utility suppliers and bank or building society who will be able to best advise you on how to go about doing so.